The following are services that have begun. The services charges for Infra services will be escalated by ~5% from 1st August 2017. Standard discounts that can be availed of are listed here. Premium prices for large enterprises. Details available here. Pricing policies (including escalation) are explained here. Venture Center policy for issuing Letters of Intent (LOI) and Letter of Commitment (LOC). Policy available here. Pre-incubation Program: This program aims to nurture and advance technology projects at their early stage, that have significant potential for being incorporated into independent start-up ventures after reducing certain uncertainties or technology de-risking following more proof-of-concept studies. Resources for start-ups:This program aims to support and nurture entrepreneurial science-based companies with advice and referrals, service offerings, access to resources, for networking and visibility. Address Service including the Associate Incubatee Program (Start date: 1 July 2007): A respectable "NCL Innovation Park address" to get technology enterprises started. Includes Postal address, mailbox, email intimation and basic reception services. 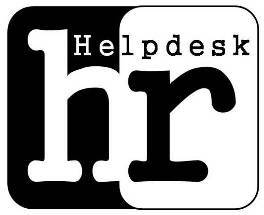 Hot Desking Service (Start date: 1 August 2007): Plug and Play office space. Includes High speed internet, basic utilities, parking space, security etc. Complimentary Library membership. Service support package for fellows (Start date: 7 January 2017): Plug and Play desk space in a shared office. Includes High speed internet, basic utilities, parking space, security etc. Complimentary Library membership, free access to hot labs, analytical equipment and Tinkering lab, IPFace services and mentoring advisory resources. Dedicated, full service office space (Start date: 1 April 2009): 175-300 sq ft office space. Includes High speed internet, basic utilities, parking space, security etc. Three complimentary Library memberships. Additional Access Package service (Start date: 04 Nov 2015): Service for additional staff/ consultants of resident incubatees to complement existing staff in non-overlapping shifts or as transition staff. Includes valid ID cards, access to facilities as per the original agreement for the office space/lab space. IISER Pune has opened up its Library membership to the organizations, industry and individuals by offering limited access to resources and services against a nominal fee. Dedicated lab space (Start date: 1 April 2009):300 sq ft lab space modules. Includes Fume hoods, high speed internet, basic utilities, parking space, security etc. Free usage of small meeting room. Lab Village service: Modularized shared lab facility for science and technology start-ups and POC projects. Workbench services (Start date: 1 May 2009; End date: 31 March 2013): 300 sq ft lab space modules shared between 3 people. Includes High speed internet, basic utilities, parking space, security etc. Free usage of small meeting room. Hot Labs (Start date: 15 September 2009): well equipped, Ready to use shared labs available for use on half day, full day or monthly basis. Flow Cytometry Services (Start date: 1 Jan 2015) : BD LSRFortessaTM cell analyzer with 5 lasers - Blue, Red, Violet, Yellow-Green, and UV. Detection of up to 18 colours simultaneously. 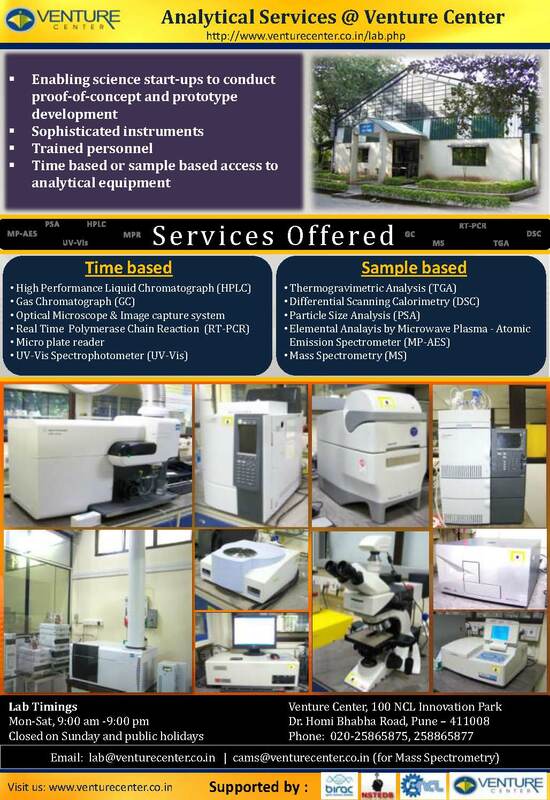 Usage of Hot labs and Analytical Equipment after official working hours (Start date: 25 September 2013): Access to hot labs and analytical equipment after VC working hours until 9 pm. Infra support for Field or Open Space Experimental Trials (Start Date: 20 June 2017): Space and supporting facilities for field or open space experimental trials in the Venture Center premises for new technology initiatives, typically to install facilities related to the development, testing, demonstration and validation of prototype by resident incubatees of Venture Center (which cannot be carried out inside the dedicated laboratory spaces). Analytical Services (Start date: 15 September 2009): Access to Analytical services on per sample basis on DSC, TGA, PSA, OM and UVS. 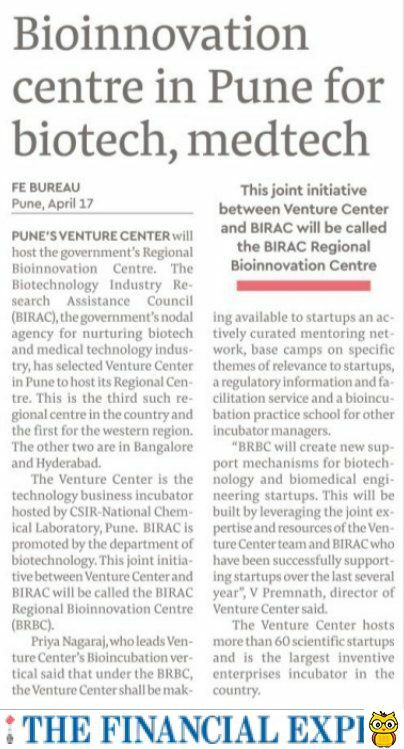 CSIR-NCL provides analytical services to Venture Center incubatees at 50% discount. 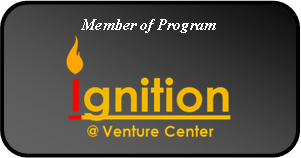 Eligibility: Applicant has to be current resident incubatee of Venture Center. Applicant has to be small company or individual innovator incubated at Venture Center. Soft Landing partners are not eligible. Fill up the Requisition Form for your needs. Email the requisition to Mr Santhosh Kadam, Business Development Division, CSIR-NCL (Phone number: +91-20- 2590-2750; Email: analytical@ncl.res.in ; sj.kadam@ncl.res.in ). Mr Kadam will first confirm that the testing can indeed be done at NCL and provide a quote. Print a hard copy of the requisition form, get authorization from Manager-Incubator, Venture Center for availing 50% discount and submit along with payment (as cheque or DD in name of Director, National Chemical Laboratory, Pune) to Mr Kadam. Follow further instructions as informed by Mr Kadam. Institutional Membership Program (Start date: 10 February 2017): Aims to facilitate access to scientific services at Venture Center for students of academic / research institutes. Demonstration of Analytical Instrumentation Facility (Start date: 27 September 2018): VC AnalytiX aims to demonstrate the working of different Analytical Techniques to students of Academic and Research Institutes. Meeting Room Service (8 seater) (Start date: 1 August 2007): Modern meeting room for business discussions. Includes projector, basic utilities, parking space etc. Board Room Service (14 seater) (Start date: 1 August 2007): Spacious and modern meeting room. Includes projector, basic utilities, parking space etc. Rooftop Meeting room (8 seater) (Start date: 1 April 2014): Modern meeting room for business discussions. Training Room Service : Learn & share in a conducive environment. Seating capacity of upto 80 people. Includes projector, basic utilities, parking space, free usage of foyer area on demand etc. E-Class Room Service (Start date: 1 August 2007): Learn & share in a conducive environment. Seating capacity of upto 35 people. Includes desks to plug laptops, projector, basic utilities, parking space, free usage of foyer area on demand etc. Lecture Theatre Service : Learn & share in a conducive environment. Seating capacity of upto 80 people. Includes projector, basic utilities, parking space, free usage of foyer area on demand etc. Conference Room (15 seater) (Start date: 25 April 2017): Spacious and modern meeting room. Includes projector, basic utilities, parking space etc. Cafeteria (Start date: 2010): Spacious, well furnished cafeteria ideally suited for breakfasts & lunches. Seating capacity of upto 75 people. Includes tables, chairs, wash area, etc. Video Conference Service (Start date: 24 Aug 2016): Offers video conferencing facility. Conference Call Service (Start date: 1 Sep 2013): Offers audio conferencing facility. 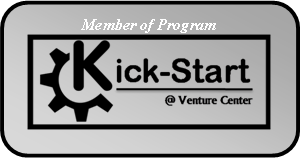 Events: Participate in a variety of events organized and/or hosted by Venture Center. Some of them are free to attend. Contact us for more details. Policy and guidelines for workshops & training program organized or co-organized by Venture Center. Referrals: We offer referrals to reliable providers of company services such as accounting, taxation, company affairs, IP filing, etc.